Today in Masonic History Carl Bert Albert is born in 1908. Carl Bert Albert was an American politician. Albert was born on May 10th, 1908 in McAlester, Oklahoma. Shortly after his birth his family moved to Bugtussle just north of McAlester. In high school he excelled at debate, was student body president and won a national oratorical contest which earned him a trip to Europe. He was also active in his local Order of DeMolay chapter and is an inductee to the Order of DeMolay Hall of Fame. In 1927Albert entered the University of Oklahoma. In 1928 he won the National Oratorical Competition and was able to earn enough money to fund his undergraduate studies. In 1931 he studied at Oxford University as Rhodes Scholarship recipient. He received a Bachelors of Civil Laws from St. Peter's College. During World War II he served in the United States Army. He initially enlisted as a private. He would later be promoted to second lieutenant. He would receive a Bronze Star and serve on the staff of General Douglas MacArthur. He would leave the army as a lieutenant colonel. In 1946 Albert was elected to the United States House of Representatives. He was immediately noticed by Sam Rayburn the Speaker of the House. Rayburn would invite Albert regularly to his "board of eduction" meetings that he would hold in his office after hours. The "board of education" was an informal meeting of members of the House of Representatives and others where they would discuss the issues of the day. Vice President Harry Truman was a regular attendee as well and was at a "board of education" meeting when he was notified of the passing of Franklin Delano Roosevelt. 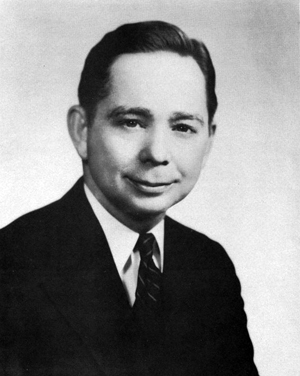 In 1955, Albert was appointed House Majority Whip. After Rayburn passed away in 1961, Albert was elected House Majority Leader. In 1971, Albert was elected the Speaker of the House. In 1973, Vice President Spiro Agnew was investigated for tax evasion, money laundering and bribes he received when he was Governor of Maryland. Agnew resigned that same year. In October of 1973, the Watergate scandal began to break. With the Vice Presidents office vacant it put Albert second in line for the office of the President of the United States. He refused to bring several votes in the house to impeach Nixon. Albert felt that it would be inappropriate for him, as a Democrat, to assume the position of President when the American people had elected the Republicans into that office. Eventually Gerald Ford was confirmed by Congress and eight months later, Nixon resigned. Albert retired in 1977, not before he had to deal with a scandal of his own. He was accused of accepting gifts from a South Korean lobbyist who was also a member of the South Korean intelligence. Albert denied all accusations. He stated that he received no money and a few token gifts which were turned over to the General Services Administration on his retirement as was required by law. After retiring Albert returned to McAlester	where he passed away on February 4th, 2000. Albert was a member of South McAlester Lodge No. 96 in McAlester, Oklahoma.